Peach season is here and this foil-pack peach crumble recipe on the grill is easy, delicious, and healthy! It’s made with juicy peaches tossed in maple syrup and a yummy crumble topping, making it a gluten free fruit crumble and a healthy dessert recipe for the summertime! Linley, here! It’s almost peach season in Minneapolis, (which means summer is passing a heck of a lot faster than I want it too, whoa). You can buy peaches other months out of the year, however come August in Minnesota, they are perfectly ripe and packed with that irresistible peach flavor. I love walking into a grocery store during peach season because the smell of fresh peaches (and hopefully peach samples) fill the air. My favorite peach? Colorado peaches. Lee and I wanted to develop a tasty summer crumble recipe that translated to a fall dessert, as well. 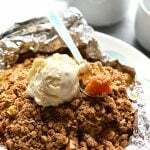 This Foil Pack Peach Crumble on the Grill is the perfect recipe for when you over buy peaches this August (I always over buy peaches). 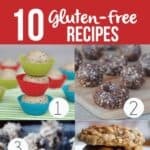 If you don’t feel like using your grill, feel free to bake it in the oven instead! Can we take a moment and talk about crisps and crumbles? One thing I absolutely love about crisps and crumbles is that I usually have everything I need in the pantry. If I’ve got apples that need to be used, or an overload of berries, I can grab some oats, flour, sweetener, and a little butter or oil and start cooking. Whether it’s in crumble, crisp, or bar form, count me in! Some of my other Fit Foodie crumbles and crisps are–> Lightened Up Berry Crisp, Triple Berry Crumble Bars, Gluten Free Apple Crumb Crisp , Lemon Blueberry Crumble Bars. 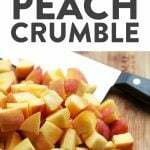 Check them out after you make this tasty Foil Pack Peach Crumble on the Grill! Seriously though, all you have to do is throw everything into a tin foil boat and you are good to go! Personally, I like my crumbles a little bit crunchier, so I like to drizzle a little coconut oil over the top of the crumble to make it extra crispy! 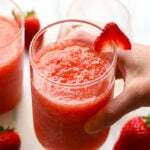 Another wonderful thing about this recipe is that if you happen to not have peaches in the house, you can always substitute a different fruit. If you’re an ice cream person, plopping a scoop of ice cream right on the top of the crumble brings this dessert to the next level. GET IT. We’ve got a lot of love for this partifuclar peach crumble recipe because it’s so easy to make! And don’t worry, if you don’t have a grill, you can totally pop this bad boy right in the oven. PS: the juicier your peaches, the better this peach crumble recipe will taste! Create an 8-inch x 8-inch tin foil pouch and spray with cooking spray. Set aside. Prepare peaches, by chopping (keep skin on)and placing in a large bowl. Squeeze on the juice from a half a lemon and add 2 tablespoons of brown sugar. Toss. Set aside. Add oats, flour, pecans, maple syrup, butter, cinnamon, nutmeg, and salt to a medium mixing bowl. Mix well to create your crumble topping. Next, layer the peaches and crumble topping into tin foil pouch by first adding half of the peaches to the pouch and then 1/3 of the crumble topping over the peaches. Then, add the rest of peaches followed by the last 2/3 of the crumble topping. Fold the top of your tin foil pouch over the peach cobbler and seal the edges with your fingers making sure there are no holes for air to escape from. 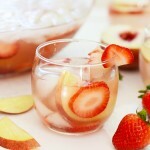 Place on grill and cook for 17-22 minutes or until the top of your cobbler is a golden brown and the peaches are bubbly. Remove from grill, let cool for 2-3 minutes, and serve with a scoop of vanilla ice cream (optional). *Recipe can also be made in the oven.